The 2006 World Series of Poker marked the pinnacle of growth for the largest event in the poker world, as the game jumped out of the niche and into the mainstream. The length of the entire event had become an endurance contest in its own right, as 45 events took place beginning on June 26 before the conclusion of the final table in the $10,000 no-limit hold’em world championship in the early hours of August 11. All tournaments were held at the Rio All-Suite Hotel and Casino, and this marked the first time in the 37-year history of the WSOP that the final table was not contested at Binion’s Horseshoe, where the tournament was created. 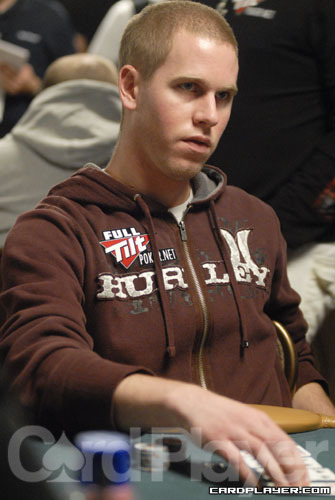 Two players won two bracelets during the 2006 WSOP, and they included Jeff Madsen and William Chen. Chen is a mathematical genius, and he used that edge to his advantage and won the $3,000 limit hold’em event and the $2,500 no-limit hold’em six-handed event. Madsen was a young gun who became the story of the tournament that year, making a debut that caught the attention of everyone. Madsen eventually won 2006 WSOP Player of the Year honors with his impressive consistency. Madsen made four final tables, finished in third twice and won two bracelets ($5,000 no-limit hold’em six-handed event and $2,000 no-limit hold’em) to make a very impressive first impression. He also became the youngest bracelet winner ever at 21 years, 1 month, and 9 days of age. Poker professionals John “Gentleman” Gale ($2,500 pot-limit hold’em), David Williams ($1,500 seven-card stud), Russ “Dutch” Boyd ($2,500 no-limit hold’em six handed), and Brandon Cantu ($1,500 no-limit hold’em) won their first gold bracelets in 2006. Meanwhile, Allen Cunningham ($1,000 no-limit hold’em), Sam Farha ($5,000 Omaha eight-or-better), David “The Dragon” Pham ($2,000 no-limit hold’em shootout), Lee Watkinson ($10,000 pot-limit Omaha), and Eric Froehlich ($1,500 pot-limit Omaha eight-or-better w/rebuys) added new ones to their collections. The pros showed that they had what it took to win in an age of gigantic tournament fields. No professional player had more success at the 2006 WSOP than Phil Hellmuth. He won his record 10th bracelet in a $1,000 no-limit hold’em rebuy event, tying him with fellow poker legends Doyle Brunson and Johnny Chan for most all-time bracelets. Hellmuth made the final table in three other hold’em events and cashed a total of eight times, increasing his record number of cashes to 56. The 2006 WSOP also featured the most exciting addition since 1970. The $50,000 H.O.R.S.E. world championship event attracted the best players in the world to compete for what has become the world championship in the opinion of the players. The tournament played out over three long days of competition and whittled down to an impressive final table featuring T.J. Cloutier, Andy Bloch, Phil Ivey, Doyle Brunson, Patrik Antonius, James Bechtel, Chip Reese, Dewey Tomko, and David Singer. Reese defeated Bloch in the longest heads-up match in the history of the WSOP (over eight hours) to take down the highly coveted gold bracelet and $1,784,640. The main event in 2006 was the largest live poker tournament in the history of the world (and still is), as 8,773 participants started play to claim the title of world champion. The prize pool was massive that year at $82,512,162, and the top 12 players would all be millionaires at the end of the tournament. After seven days of play saw the field shrink to a final nine, those finalists returned to the final table on the eighth day of the tournament to compete for the $12 million first-place prize. Those players included Dan Nassif, Erik Friberg, Doug Kim, Richard Lee, Rhett Butler, Allen Cunningham, Michael Binger, Paul Wasicka, and Jamie Gold. Gold entered the final table with an enormous chip lead, holding over 26 million, when his closest competitor, Cunningham, held just shy of 18 million. Gold quickly eliminated Nassif in ninth place, and then he won a huge pot against Cunningham 22 hands into play to grow his stack to 34.5 million. Gold busted Friberg next, in eighth place, when his pocket queens dominated Friberg’s pocket jacks. Wasicka was the next player to find pocket queens in the hole in a crucial spot, and he used them to eliminate Kim in seventh place, when all Kim could muster was pocket nines. Gold was up to his old tricks again when he eliminated another opponent with pocket queens. That opponent was Lee, who held pocket jacks and fell in sixth place. Gold then eliminated the next player, as well, as his pair of jacks held up to beat Butler’s pocket fours. Butler was out in fifth place, while Gold’s stack was up to 54.5 million. None of his opponents held more than 13 million at that point. The biggest name left in the tournament fell next when after Binger raised to 1.1 million, Gold made the call, and Cunningham moved all in for his last 6.5 million. Binger mucked, and Gold made the call again. Cunningham held pocket tens and Gold showed down K J . The board was dealt A K 8 7 3 , and Cunningham was knocked out in fourth place. The only hope that either Wasicka or Binger had at that point was to knock one another out to have any chance against Gold and his monster stack, but fate would have it that Gold would score the next knockout, as well. Binger raised to 1.5 million preflop, and both Gold and Wasicka made the call. The flop was dealt 10 6 5 , and Wasicka checked. Binger bet 3.5 million, and Gold moved all in. Wasicka mucked, and Binger made the call. He flipped up A 10 for the lead, while Gold showed 4 3 for an open-end straight draw. The turn brought the 7 , which gave Gold his straight, and after the Q fell on the river, Binger was out in third place. When the heads-up match began, the chip stacks were a world apart. Gold’s 78,975,000 took over his entire side of the table, while Wasicka’s 11,225,000 looked paltry in comparison. The match lasted just seven hands. When Gold raised to 1.7 million preflop, Wasicka made the call. The flop was dealt Q 8 5 , and Wasicka bet 1.5 million. Gold raised all in, and Wasicka made the call. Wasicka held pocket 10s, but Gold turned over Q 9 . The turn and river fell A 4 , and Gold was the world champion after one of the most dominant victories in WSOP history.